The Intelsat 33e and Intelsat 36 satellites are set for launch Aug. 24 at 2155 GMT (5:55 p.m. EDT) at the opening of a 45-minute window. Two Russian-owned Antonov An-124 cargo planes delivered the spacecraft to French Guiana earlier this month, with Intelsat 33e arriving July 21 from its Boeing factory in El Segundo, California, and Intelsat 36 landing July 25 after a trip from Space Systems/Loral’s Palo Alto, California, manufacturing plant. After ground crews unloaded the satellites from their transport planes, technicians drove the spacecraft from the airport in Cayenne to the Guiana Space Center about 40 miles (65 kilometers) to the northwest. Once inside their clean rooms at the spaceport, the satellites were removed from their shipping containers to begin a sequence launch preps including final tests, fit checks, fueling and mounting atop the Ariane 5 rocket. The Intelsat 33e spacecraft, based on the Boeing 702MP satellite design, is the bigger of the mission’s two payloads. It will ride in the upper position inside the Ariane 5’s nose cone. Once fueled, Intelsat 33e will weigh nearly 14,500 pounds, or about 6,575 kilograms. The smaller Intelsat 36 satellite, built on Space Systems/Loral’s 1300 series platform, has a launch weight of approximately 7,165 pounds, or about 3,250 kilograms, according to Arianespace, the Ariane 5’s commercial operator. 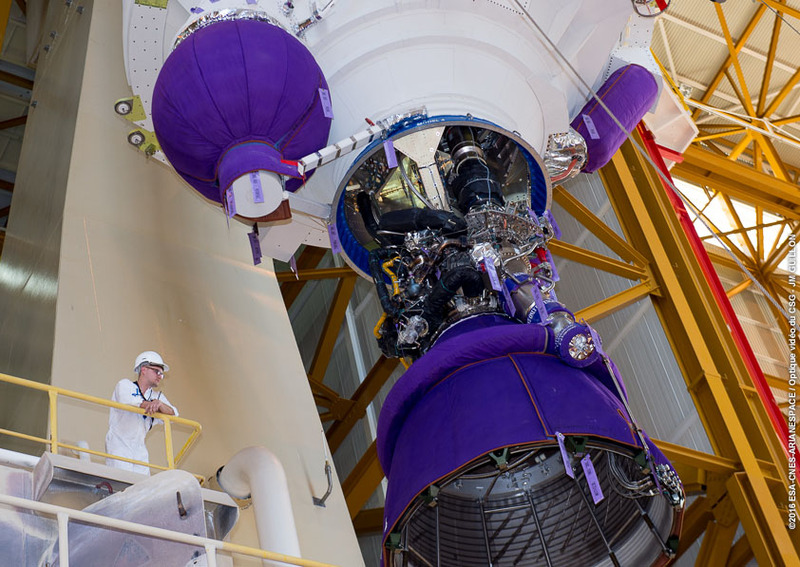 Workers will build up the Ariane 5’s payload section by hoisting Intelsat 33e atop the rocket’s Sylda dual-payload adapter, then enclosing the composite inside the launcher’s Swiss-made payload fairing. Intelsat 36 will be lifted directly onto an attach point on top of the Ariane 5’s second stage. Then the structure with Intelsat 33e, the Sylda adapter and the fairing will be lowered over the Intelsat 36 satellite to complete assembly of the rocket in mid-August. The 180-foot-tall (55-meter) Ariane 5 rocket will roll out to the Guiana Space Center’s ELA-3 launch pad Aug. 23, the day before liftoff. The Aug. 24 launch will mark Arianespace’s sixth flight of the year, and the fourth by an Ariane 5 in 2016. 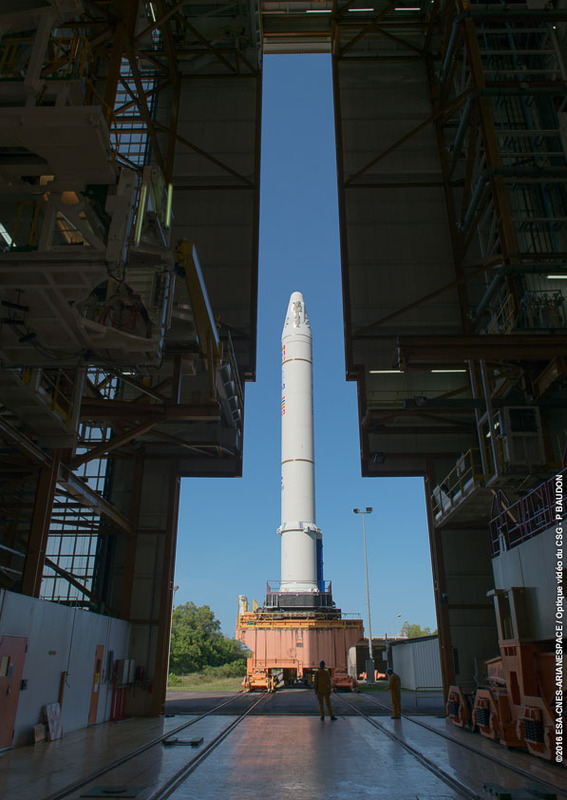 It will be the 87th Ariane 5 launch overall. Meanwhile, crews from Airbus Safran Launchers, the Ariane 5’s prime contractor, delivered components for next month’s mission from Europe to French Guiana on July 18, and almost immediately erected the rocket’s first stage inside Kourou’s launcher integration building July 9. The Ariane 5’s two solid rocket boosters, each standing about 100 feet (30 meters) tall, were added later July 9 and July 11, followed by stacking of the hydrogen-fueled upper stage July 15. Intelsat chief executive Stephen Spengler told investment analysts last week he has little concern about putting two of the company’s large satellites aboard the same flight. 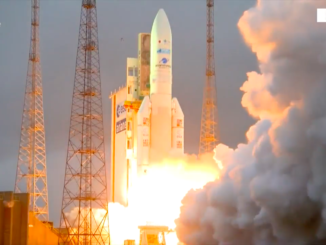 Intelsat has never launched two satellites on the same rocket before, but it follows in the footsteps of Eutelsat and DirecTV, who have flown two spacecraft at a time aboard single Ariane 5 launches in recent years. Intelsat 33e will be the second spacecraft launched under the more than $2 billion multi-satellite Intelsat Epic initiative to extend the capacity and reach of the company’s communications network. The satellite can route up to 25 gigabits of data every second through its sophisticated communications instrumentation, and Intelsat 33e hosts the equivalent of more than 200 transponders in C-band and Ku-band frequencies. That is up to five times the capacity of conventional commercial communications satellites, according to Intelsat. 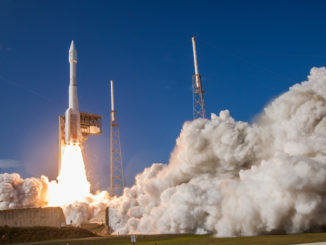 Intelsat 33e will replace and expand coverage currently provided by the Intelsat 904 satellite launched by an Ariane 4 rocket in February 2002, offering Internet connectivity, television and radio broadcasting, cellular backhaul, and communications support for airplanes and ships. The Intelsat Epic satellites carry reprogrammable digital communications payloads, and some of the Epic-class technology has its roots in the U.S. Air Force’s Wideband Global SATCOM series of communications satellites, also made by Boeing. “We have a digital payload on Intelsat Epic,” Spengler said in last week’s quarterly earnings call. “That digital payload covers 100 percent of the frequencies on the satellite, which means that there’s exceptional connectivity, flexibility across the satellite, and it has attributes that are very well appreciated by government customers, such as anti-jam and interference mitigation capabilities. Intelsat 33e joins the Intelsat 29e satellite launched aboard an Ariane 5 rocket in January. Intelsat 29e’s covers the Americas, while Intelsat 33e will be positioned in geostationary orbit at 60 degrees east longitude, putting Europe, Africa, the Middle East, the Mediterranean, the Asia-Pacific and the Indian Ocean region within its range. Early demonstrations of Intelsat 29e’s capabilities have included a government test using the satellite to relay live video from a remotely-piloted drone aircraft, Spengler said. “Our Intelsat 29e customers are experiencing better-than-expected performance, and our tests on new ground hardware with ecosystem partners is indicating the same,” Spengler said. The Intelsat 36 satellite slated for the Aug. 24 launch, dubbed VA232 in Arianespace’s flight manifest, is a growth mission for Intelsat, adding capacity for direct-to-home television broadcasts in sub-Saharan Africa and video distribution in South Asia. It will be positioned at 68.5 degrees east longitude along the equator, joining the same slot occupied by the Intelsat 20 satellite in geostationary orbit. The Ariane 5’s deployment of Intelsat 33e and Intelsat 36 will complete the company’s 2016 launch campaign of four new satellites. 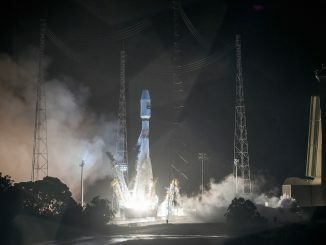 The Intelsat 31 telecom platform successfully launched on a Proton booster in June, following the January launch of the first Intelsat Epic-series craft. Spengler said the new additions to Intelsat’s fleet, particularly the Intelsat Epic birds, should help slow or reverse the company’s declining revenue and backlog brought on by market pressures. The financial results have also triggered a fall in Intelsat stock prices.